WE BOUGHT A HOUSE!! Our first house! It just closed today so it's totally ours! *Happy dance* I'm so excited!! We've been keeping our eye out on the market in Indiana for a few months and it seemed like everything we looked at just sold right underneath us! It was hilarious! And a little stressful. I totally thought it would be like: "Oh, I like this house, I'll buy that one!" Not even. Apparently there are other people in Kokomo, and they want to buy houses, too. Did not see that coming. But we found one that we're so happy with, I can't wait to see it in person. Oh yeah. I haven't seen it in person yet...I don't know if that makes us adventurous or just stupid, haha! :O) Luckily, we had some great friends check it all out, and they know what they're doing. Boy, we get a house today, a cute little boy on Friday...we're getting all the things this week! Thank you, God for these blessings. Congrats, Disney and family! What a big week for you all! Thank you! I'm all set to adore living in Indiana. :) it seems lovely there! Disney - so very happy for you, Micah, Paige, Ace, new house, new business, and most of all, God's work for you in Indiana. WA will really miss you all. Sending love & hugs, Ida & Ken, too. Thank you, Ida! We really appreciate that. We've missed you guys! Can't wait to see more pictures. 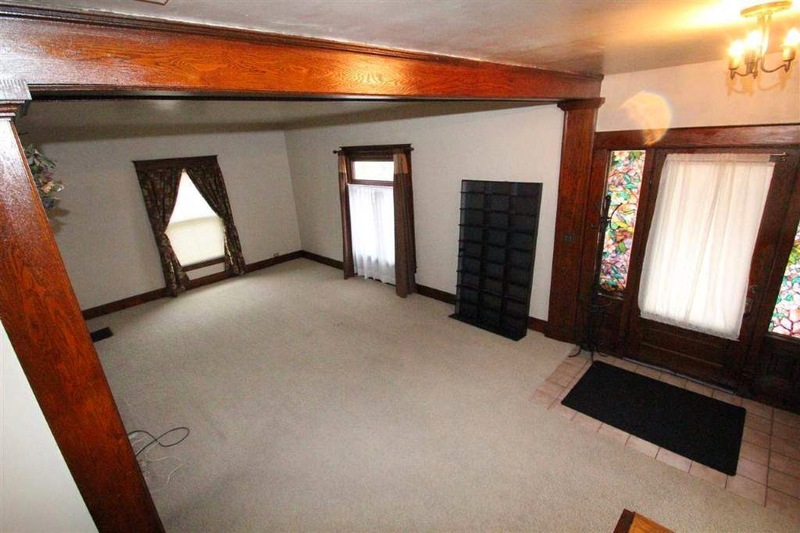 I have a house that was built around the same time all mostly original unpainted trim and original floors. If your trim does need sprucing up, I can't recommend Howard's Restor-a-finish enough! Congrats! Thank you, Joy! I'm super excited for Friday as well. So much to praise God for! Hello.I have read your post this morning.I am from Turkey.I have ever been in INDIANA but I like your house and you are very happy I have understand this.I like wood detail in a house.I wish your happiness in taht house. I am also happy meeting with people who are so far.Thank you so much for your answer. Congrats my dear.. Cant wait to see how you decorate & furnish this beautiful place.. Enjoy!! A big congratulations from me from Downunder as well, Disney. I just love the look of that stained glass as well. You are going to love that house! It's so beautiful! Think of the fun you're going to have with the nesting! Congratulations, Disney. Congratulations! That wood trim is dreamy! I can't wait to meet Ace. I am so excited for you guys! And thank you for saying you'll keep the wood trim. It's gorgeous. I think it's crazy when some people just paint everything...and I sit there and think..."Can I have your old kitchen before you tore it/out painted it? I'd be happy with the way it is...you should see what I'm dealing with over here! :)" I'm so glad you are having a great month. Good luck with everything Friday!!! I am so thrilled for you guys. A boy and the girl in the family is the best! Congrats on the house and the little boy!!! The house is gorgeous, I love the old trim! Does it have original wood floors too? That would be amazing! Congrats on the house! I miss Kokomo so much! We lived there for 3 years when my husband worked for Delphi. I can't wait to hear about your new adventures there! Also, congrats on the adoption! So many exciting things happening!